Even though it's a half Ironman that you're training for, it's still a tough endurance race and one that requires the same attention to training that you would give if it were a full Ironman. Also known as the 70.3, the half Ironman includes the same swim, bike and run as the full but at half the distance. So that means a 1.2 mile swim, 56 mile bike ride and 13.1 mile run. If you want to finish your race and finish strong, pay as much attention to your diet as you do your training. 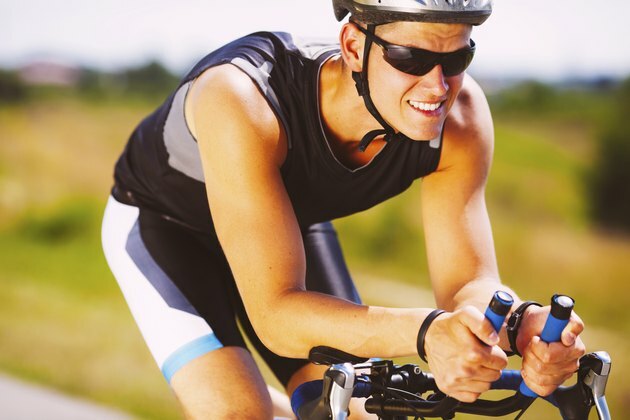 Training for a half Ironman is not the time to go on a weight-loss diet. You need to eat enough calories to not only fuel your workouts, but also help you preserve and build your muscle mass. How many calories you need depends on a number of factors, including age, gender, body composition, training schedule and typical daily routine. You can estimate your calorie needs for training by determining your resting energy expenditure, or REE, and multiplying that by an activity factor. For men, it's 11 multiplied by your weight in pounds multiplied by 2.1; for women, it's 10 multiplied by your weight in pounds multiplied by 1.9. Most of the calories in your diet should come from carbs -- 55 to 60 percent. That's because carbs are your body's preferred source of energy, especially when working out for a long period of time. Getting enough carbs also spares protein, so you don't burn muscle when training. For proper fueling, most of your carbs should come from complex sources, such as whole-grain bread and cereals, beans, pasta and potatoes. When training for your half Ironman, 12 to 15 percent of your calories should come from protein. You need adequate intakes of protein to repair and build the muscles you're training. Getting enough protein also helps keep your immune system strong. Healthy sources of protein include lean red meat, poultry, seafood, eggs, low-fat and nonfat dairy foods and beans. Just because you're working out hard doesn't mean you get to eat all the cheeseburgers and ice cream you want. Like everyone else, you still need to make the right food choices when it comes to fat. When training, 20 to 30 percent of your calories should come from fat. For health, you should limit the amount of fat from foods high in saturated fat such as high-fat red meat and full-fat dairy foods, and instead include healthy sources of fat such as nuts, seeds, fatty fish and vegetable oils on your training diet. Eat healthy meals consisting of whole grains, lean proteins and fruits or vegetables regularly throughout the day to help keep your blood sugar steady. You need to eat a low-fat, low-fiber, carb-rich meal two to four hours before your training session, such as an English muffin topped with peanut butter and a banana or a low-fat yogurt with an apple and a bagel. To replace energy stores, eat or drink a high-carb food 15 minutes after you've finished exercising such as juice or a piece of fruit. Two hours after your training, eat a high-carb, moderate-protein, low-fat meal or snack such as a turkey and cheese sandwich with an orange, or spaghetti and turkey meatballs with steamed broccoli.